NEW YORK — An estimated one million people may already die each year because they are resistant to all known antibiotics, and the number could reach 10 million per year and devastate the world economy by 2050 unless key steps are taken, experts from the United Kingdom and South Africa told a press briefing on antimicrobial resistance at United Nations headquarters today. Davies was joined at the press briefing by Lord Jim O’Neill, chair of a much-discussed review of antimicrobial resistance, and Aaron Motsoaledi, minister of health of South Africa and chair of the Stop TB Partnership. The focus of the effort is on a Review on Antimicrobial Resistance led by O’Neill. Bacteria multiple every 20 minutes so drug-resistant mutations can spread quickly, said Davies. Even more concerning, bacteria that develop the resistance will put out a little tube to neighbouring bacteria to give them the resistance as well. “We have essentially a dry pipeline,” she said, so extra care needs to be taken to ensure people do not develop resistance to existing antibiotics. So far, more people still die from not getting access to antibiotics than from resistance, she said, making “appropriate access” important. 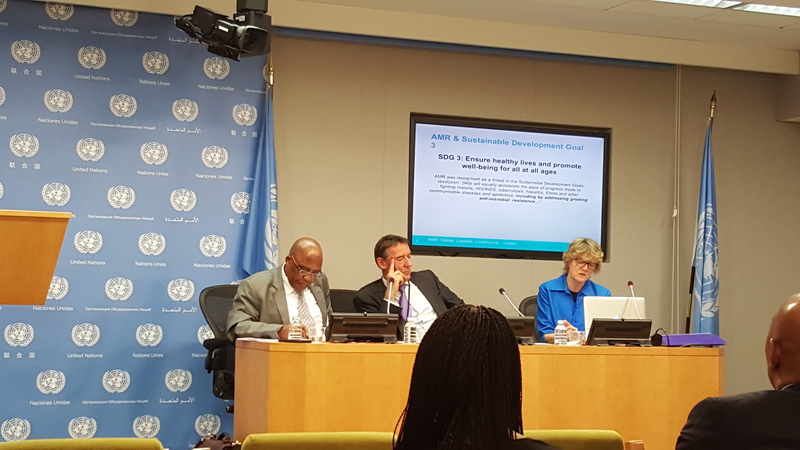 Failure to solve the AMR question will mean failure to achieve the 2030 Sustainable Development Goals (SDGs), she added. One of the purposes of those involved in the effort is to “make a lot of noise,” O’Neill said. They are seeking to raise the level of awareness of the problem to that of smoking, and are undertaking a global awareness campaign. The issue is gaining ground at the highest policy levels, the speakers said, as it is expected to be addressed at upcoming G20 meeting to be held in China (and beginning with a G20 “sherpas” meeting later this month at which finding ways to pay is on the table). It then will be the subject of a UN High-Level Meeting on 21 September, only the third meeting ever dedicated to a health issue (AIDS, non-communicable diseases). The high-level meeting could address issues such as stewardship and reducing the use of antibiotics in agriculture for animals consumed by humans. The report details the lack of research and development into new antibiotics and suggests a way to address the shortcoming but creating a system of market entry rewards that would more fully reward products most valuable to society. The report also mentions patents and says the system would de-link the price of the products from the cost of R&D, with successful companies agreeing to make it accessible to the developing world at the “right” price, as O’Neill put it in the press briefing. The annual World Economic Forum in Davos signed an agreement on this, he noted. The delinkage principle is “broadly accepted” by industry, he said. What is being debated is incentive. O’Neill led the review which came up with 29 recommendations he said would solve the AMR problem if followed. They would cost some $40 billion, but would save the world from the “devastating reality” and a potential $100 trillion cost if AMR is not solved by 2050. The world economy is now about $70-80 trillion per year, he said, and grows over time by about 3-4 percent. But AMR would undermine this. He also said the return on the $40 billion investment gives a “2.5 thousand” percent return. “That’s an investment fund I’d like to run,” O’Neill remarked. The report offers alternative ways to come up with the $40 billion, not all from the public sector, and includes funding for research into new drugs. This report was also a hot topic at the 23-28 May World Health Assembly. O’Neill in 2001 coined the term “BRIC” when he showed that Brazil, Russia, India, and China (BRIC) [corrected, South Africa was added later to make “BRICS”] could be economically bigger than the Group of 7 (G7) by 2050. He said that unsolved, people would no longer be able to have procedures we now “see as our right,” such as repairing cataracts, having caesarean births, or knee replacements, for example. There is a “high likelihood” of an agreement at the high-level meeting in September, but it remains to be seen how “bold” it will be, he said. Minister Motsoaledi talked about the effort against tuberculosis as an example. He said at current rates, efforts to stop TB could take some 180 years, and that more people are developing drug-resistant TB. In some countries, treating drug-resistant TB – which has only a 50 percent cure rate and involves a mix of toxic drugs – is eating up budgets. Motsoaledi added that more research is needed in order to get away from a broad spectrum antibiotic, which he compared to firing scattershot all over the forest in order to hit one target. He also said developing countries need to strengthen their health systems in order to be able to respond to these threats. O’Neill said they urge that by the end of this decade, no antibiotics be given without proper tests. "Antibiotic Resistance Is “Already Here” And Pipeline Is Dry, UK Health Minister Tells UN" by Intellectual Property Watch is licensed under a Creative Commons Attribution-NonCommercial-ShareAlike 4.0 International License. Subject to correction, I suggest that it isn’t the people who become resistant to antibiotics, but the bugs that attack those people. It may not be the ideal time for the US Supreme Court to have decided that products derived from Nature (as most antibiotics are) are generally not patentable.